WinX iPhone Video Converter is a comprehensive and user friendly iPhone video converter application from Digiarty Software. The iPhone video converter program has been designed to convert most of the popular video formats such as AVI, MP4, WMV, MPEG, FLV, HD formats AVCHD, M2TS, HDTV, BDTV, MKV to iPhone and extract audio to MP3. 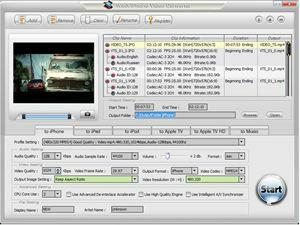 The converter program is also able to convert JVC, Sony, Panasonic and Canon camcorder videos to iPhone, iPod, iPod touch, iPad, Apple TV and Apple TV HD. Fast speed with multi-core CPU and hyper-threading technology. Unique high quality engine and advanced de-interlace accelerator to deliver best video and audio quality. Completely convert regular video formats such as AVI, WMV, MPEG, FLV and etc to iPhone, iPod, iPad and Apple TV. Freely convert most HD videos formats such as AVCHD (MTS, M2TS), HDTV, BDTV, H.264/MPEG-4 AVC and MKV to iPhone, iPod, iPad and Apple TV. Convert popular HD camcorder videos such as JVC (*.mod, *.tod), Sony (*.mts, *.m2ts), Panasonic and Canon to iPhone. Able to extract audio to MP3 and capture screenshot as BMP and JPEG pictures. Supports video trim and split. Able to adjust video and audio parameters such as video frame rate, video resolution, audio sample rate to get diverse video and audio effects. As a Christmas giveaway, Digiarty Software is now giving away WinX iPhone Software Gift Pack until 31 December, which includes WinX DVD to iPhone Ripper, WinX iPhone Video Converter and WinX iPhone Ringtone Maker. Activate WinX iPhone Video Converter with “AI-TTUDYUXV-GHFQFD” license key code.